Wall Street greed has been around as long as stocks have been trading (the NYSE was founded in 1792). But it’s hard to blame stockbrokers for the damaging effects of greed. Stock-peddlers are like well-paid psychologists. They take advantage of human greed. Without investor greed, the stock brokerage business would be considerably smaller than it is today. A stock bubble can’t exist without investor greed. It starts with greed. It moves into the “bubble” phase when greed is consumed by hysteria. The U.S. stock market has moved into the “hysteria” stage. This would be the point at which the bubble has almost reached maximum inflation. The upward movement in stocks is dominated by a handful of the stocks that, for whatever reason, are moving higher at the fastest rate of levitation. The graphic on the next page shows visually what “bubble to hysteria” looks like. I reached the conclusion the stock market has moved into the hysteria stage by spending time studying the “Five Horsemen” (AAPL, AMZN, NFLX, FB, MSFT) + TSLA. Even during periods of the trading day when the Dow and SPX are go red, most or all of those six stocks remain green, sometimes moving higher while the broad indices move lower. It’s incredible to watch real-time. “It’s not to late to catch a ride on the FANG rally” was a headline seen on CNBC last week. This is the type of hysteria that is reflected in the media at bubble peaks. In the image above (click to enlarge), the graph on the left is the NASDAQ index since the election (from Jesse’s Cafe Americain). 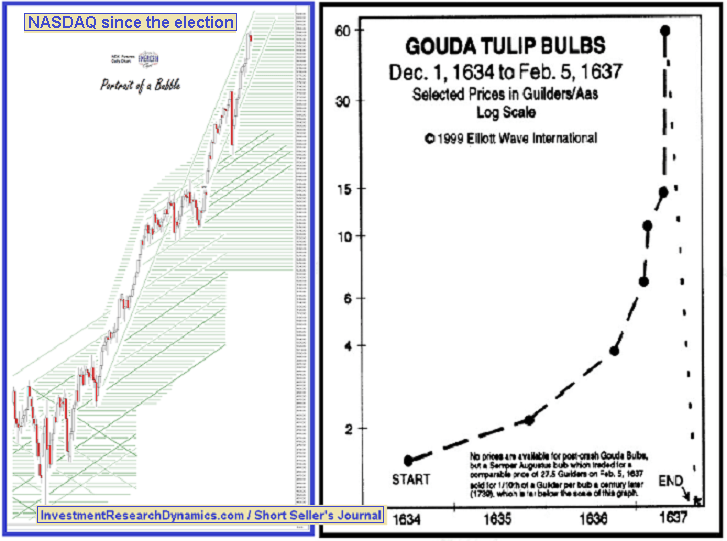 The graph on the right is the price-path that occurred during the Dutch Tulip Bulb mania of the 1630’s. You can see that both graphs go vertical. The vertical stage is driven by hysteria in which investors are terrified of missing the next move higher. It also ends with a decline, the rate of which is typically stunning. 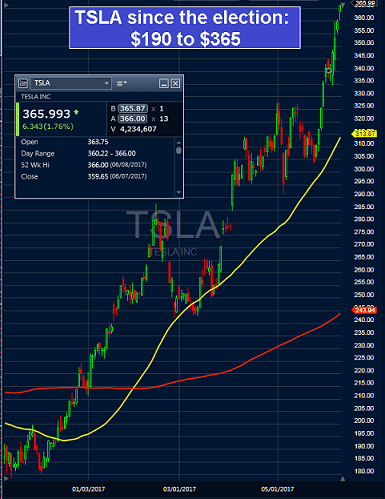 The push higher in stocks like AAPL and AMZN is irrational, but TSLA has been infected with outright hysteria. The worse the news on Tesla gets, the more quickly the stock seems to move up in price. Early in the week last week, Triple-A (the Auto Club group) announced that it was going to raise the its insurance premiums on Tesla cars by as much as 30%. A highway loss data study revealed that Tesla’s vehicles have higher claim numbers and repair costs vs. other vehicles in Tesla’s category. The Tesla S model claims were said to be 46% greater than the average number of claims for similar vehicles. Servicing those claims cost twice as much. The X model car reported a 41% higher crash-rate than similar vehicles and cost 89% more to repair. In addition, it was reported on Monday that Toyota had unloaded the last of its remaining stake in Tesla before the end of 2016. It marked the end of a collaboration between Tesla and Toyota that began in 2010. Toyota announced that it plans to release its own fleet of long-range mass produced electric vehicles by 2020. Despite this blow of negative news about Tesla, the stock powered up over 8% last week before a late-day sell-off in the 5 Horsemen + Tesla inflicted a $19 reversal in TSLA’s stock price from its high Friday to the close. My puts, the June 30th $317.50-strikes, traded from Friday from a low of $1.06 to close at $2.40 on the bid side. While the NASDAQ has appreciated 22% since the election, TSLA’s stock, on deteriorating fundamentals, has shot up 191%. TSLA’s market cap now stands at nearly $61 billion. It burns over $1 billion per year in cash and its financials are riddled with what would have been considered accounting fraud 20 years ago. It sold 72.6 thousand cars in 2016. Compare this to GM, which has a market cap of $51 billion and sold over 3 million cars in 2016, and Ford, which has a market cap of $44 billion and sold 2.5 million cars in 2016. To say that the action in TSLA’s stock price and its market cap is “insane” does not do justice to the word in “insane.” TSLA is the “poster child” for the mass hysteria that fuels investment bubbles. The problem with shorting TSLA is that the hedge funds are chasing its momentum higher, as investors as investors embrace the negative news events as a reason to pay more for the stock. As such, it’s hard to see a catalyst that will “correct” the price, like with retailers for instance. TSLA, along with AMZN, is one of the rare stocks which will continue levitating until it doesn’t – like a meteor that eventually burns out falls to earth. The above analysis and commentary is from the latest <ahref=”http://investmentresearchdynamics.com/short-sellers-journal/”>Short Seller’s Journal, in which I present a “Big Short” mortgage derivative stock that will eventually drop close to zero from it’s current price in the mid-teens. You can find out more here: Short Seller Journal info. Piper Jaffray stock analyst, Alexander Potter, in what may be the most idiotic stock research report I’ve ever read, issued a buy recommendation on Tesla (TSLA) stock that is completely devoid of any rational arguments or coherent thought: “before investors can follow our advice and buy TSLA shares, they need to employ a ‘creative’ valuation methodology…” Anyone who suspends disbelief and reads that report is more dumb for having done so. Creative valuation methodology? I had to read that 3 times before I could believe that he put that in the conclusion of his report. That sounds like something used in conducting human investment analysis tests on stock analysts who have taken LSD. The CIA might be interested in experiments like that. While issuing his bullish assessment, Potter at the same time reduced his FY 2017 earnings estimate from $0.42/share to a loss of $4.83. I shocked that this analyst was forecasting positive net income at all. But a reduction in an earnings forecast of that magnitude would seem just too embarrassing to report. Maybe Potter was indeed experimenting with LSD when he was thinking about his investment thesis. As it is, TSLA uses “creative” accounting methodologies in recognizing “revenues” that would make Amazon’s Jeff Bezos blush with embarrassment. The Company burned over $1.5 billion in cash in 2016 in its business operations. This was covered by the most permissive credit and equity markets in U.S. history, which handed over a net $2.7 billion to the Company in 2016. While the Piper “analyst” claims to have gotten to know the Company because he drove a Tesla around for seven months and met with Tesla’s IR team, he apparently eschewed real fundamental analysis in favor of “creative” methodologies. The fact that TSLA’s actual vehicle deliveries declined in Q4 from Q3 was creatively removed from his hockey-stick earnings projections. It will get really interesting for Tesla when the tax credits for the first 200,000 vehicle buyers expire. TSLA’s sales are being subsidized heavily by the U.S. taxpayer and yet the company has lost $1.5 billion on GAAP net income basis in which the “net income” was derived using a highly “creative” interpretation of GAAP accounting. TSLA’s buyback guarantee, in which it has guaranteed the resale value on vehicles sold or leased up until August 2016, has already created a $2.3 billion future liability. Given the plunging prices in the used car market, it is likely that the true level of that resale guarantee is closer to $4 billion. TSLA delivered 79k cars in 2016 while Ford delivered 2.6 million. Yet the stock market creatively assigns a market value to TSLA that is about $5 billion higher than Ford’s. It’s debatable whether or not Tesla will be able to start delivering its highly touted Model 3 before mid-2018 given TSLA’s track record of failure at meeting delivery schedules. Quite frankly, what’s more amazing than Tesla’s ability to bamboozle investors into throwing more money at the Company’s cash inferno is the willingness of stock “analysts” like Piper’s Potter to release “creative” research reports that read more like “The Onion” than a responsibly prepared business model and projected financial analysis. Tesla’s GAAP “book value” is listed at $4.7 billion, or $32/share. Of that $4.7 billion, $3.4 billion is cash that will soon be burned away, leaving $1.3 billion in book value or $9/share. If we mark to market the car value guarantee, Tesla’s book value goes negative. If we mark to market its $5.9 billion in PP&E, the book value becomes catastrophically negative. The shorts who defy Elon Musk’s childish Twitter taunts and remain short will eventually make a fortune when reality inevitably seizes the stock market and takes “creatively” valued stocks like Tesla down their intrinsic value, which is close to zero. Tesla created massive confusion in the financial reporting and analyst community by allegedly coming clean and report actual GAAP quarterly financial results for its 3rd quarter. But of course, just like the entire U.S. Banana Republic, the use of extreme obfuscation, deceit, propaganda and lies once again is the norm with Tesla’s quarterly report. TSLA’s use of revenue recognition, deferred revenue and operating leases and its definition of “free cash flow” are enough to create a dedicated forensic accounting case study at the University of Chicago Graduate School of Business, where I did indeed nearly ace a forensic accounting course. I don’t have enough time to lay out all of specifics and I’m not getting paid to write this blog post – but suffice it to say that several items in Tesla’s financials this quarter serve as big red flag warning flares. Of course, the market probably won’t care, as it seems that the market cap of a company’s stock is directly proportional to the grandiosity of the Company’s accounting abuse and fraud. And there’s no one in DC to enforce the laws already in place that are designed to prevent this fraud because the guys running these companies make substantial contributions to the Establishment politicians – just ask Jeff Bezos and Hillary Clinton. But I’ll point out some of the glaring problems in TSLA’s “GAAP” accounting based on cursory sleuthing. First and foremost, in his description of the results for the quarter, Musk stated that “residual lease risk” exposure was 32% of deliveries, down from 36% in Q2. But this is a highly deceptive metric. IN FACT, deferred revenue as a percentage of total revenue for the quarter soared to 61.4% from 44% in Q2. Deferred revenue is the amount of revenue that is subject to “residual risk” from leasing financing. This number is found on the liability side of the balance sheet. The deferred revenue liability account went from $558 million in Q2 to $1.4 billion in Q3. This is a huge jump in amount of risk-infused lease-based financing used to generate sales. In and of itself, using deferred revenue accounting to this degree is highly subjective and susceptible to fraudulent risk assumptions. But the fact that Musk tries to mask the truth by using a bogus metric to make it seem like TSLA’s exposure to the residual risk embedded in the profoundly questionable leases used to generate revenues and unit sales is a loud signal that there’s fraud embedded in TSLA’s “GAAP” financials. When you look at what is being reported as “GAAP operating income” consider that a huge proportion of that income is subject to the risk of coming back at the company in form of “one-time” GAAP charges which result from having to reverse out a large portion of the “GAAP” revenues when the value attached to the cars that will likely come flying back at TSLA when the leases expire is substantially lower than the amount guaranteed by TSLA. This “GAAP” presentation makes a farce of bona fide accounting standards. Another huge red flag is the huge jump in accounts payable. In June, accounts payable were 87% of revenues. But by September, accounts payable were more than 100% of revenues. The only reason TSLA would stretch out its payables like this is if it needed the cash. Not paying bills for a company like TSLA is a source of free financing. But this is an extreme slow-down in bill payments. There’s no way to know for sure what’s going on, but something is wrong. A third huge red flag is the way in which Musk throws around the term “free cash flow.” His definition is just as fraudulent as Amazon.con’s definition. At this point in time, because TSLA has only released an 8k which does not contain an GAAP statement of cash flows, there’s no way to know the amount of free or negative free cash flow attributable to TSLA’s operations. That is, “free cash flow” in the context of the deceitful manner in which TSLA’s financials are presented. Having said that, Musk states in the 8k that TSLA generated “positive free cash flow.” No, Elon, you did not. Buried in the 8k is a section titled, “selected cash flow information.” He lays out his definition of “free cash flow” showing $176 million defined as cash flows provided by operating activities less capex. The GAAP definition of free cash flow, however, also includes debt repayment and other sundry items that drain cash. We won’t know the full extent of these items until the 10Q is released. However, TSLA reported that it payed down $178 million on its borrowing facilities. Using GAAP free cash flow, this takes Elon free cash flow negative. Furthermore, if TSLA had maintained accounts payable at 86% of revenues, this would have sucked another $324 million of cash from TSLA’s operations, leaving the Company with a free cash flow deficit of $326 million. There’s a lot more going on with TSLA’s operations that is deceitful, if not outright fraudulent. This is just the “low hanging fruit.” At some point the capital markets will stop funding this fraud and that’s when the fun begins. Of course, by that time insiders will have sucked $100’s of millions of wealth out this Company that will never be retrievable. In just the last 12 months, insiders have unloaded 4.1 million shares, or roughly $860 million worth of stock. Oh wait, there was one open market purchase of stock by an insider of a whopping 1,394 shares. It’s my view the idiotic shareholders who give money to TSLA deserve what they’ll get eventually. But then again, many of them are sheeple who have placed trust in financial fiduciaries, like pension managers and investment advisors, to invest their savings.